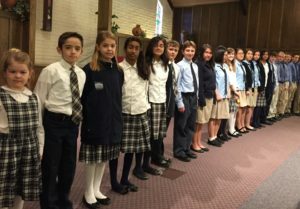 Redeemer Christian School admits students of any race, color, national or ethnic origin, male or female to all rights, privileges, programs, and activities generally accorded or made available to students at the school. The school does not discriminate against anyone, male or female on the basis of race, or national or ethnic origin in the administration of its educational policies, admissions policies, scholarship programs, and athletics, music, fine arts or other school-administered programs. 1. Return a completed ‘Application for Admission’ Form to the school office. A non-refundable application fee of $50.00 must accompany the completed form. Download the Form HERE. 2. The incoming student must take a Placement Test or Readiness Test (for Kindergarten.) The testing fee of $50.00 is to be paid at the time of testing. The Kindergarten Readiness Test is scheduled through the front office, 480-926-5003. 3.The parents/guardian and student must be interviewed by the Principal or a member of the RCS Board. 4. If the student is accepted to RCS, the parents and student will be sent a letter of acceptance for admission and enrollment materials. Age Requirements: A child should have reached the age of five (5) years by September 1 of the Fall in which he would be entering Kindergarten. A child entering first grade should have reached the age of six (6) years by September 1 of the Fall in which he would be entering first grade. Exceptions may be granted by the Administration. School Readiness/Placement Testing: Kindergarten applicants will be administered a school readiness test. Grammar school students, grades 1-5, will be administered an academic assessment by RCS as the primary means of determining their class placement. Other diagnostic or academic results, scores on standardized tests, or grades from other schools may be accepted in lieu of testing. Immunization Requirements: Students are to comply with the Arizona School/Child Care Immunization Law. Requirements are available in the school office, or available on the Arizona Department of Education website, HERE. Respect for Teachers and School Guidelines: The student must understand that the school is acting in loco parentis (in place of the parents) and therefore he/she is subject to the instruction and discipline of the teachers and administrators in their prescribed roles at RCS. Student Desire: A new student entering the sixth grade or above must complete the New Student Questionnaire to attend RCS, which is available HERE. Professing Christian Faith: At least one parent/guardian must be a professing Christian, and must have a clear understanding of the biblical philosophy and purpose of RCS. Family Cooperation: The parents/guardians must be willing to cooperate with all the written policies of RCS, assure that their child understands that he is subject to the instruction of discipline of the teachers and administration, and adhere to the terms of the Enrollment Contract, and terms in the Parent/Student Handbook. Financial Responsibility: Parents are expected to uphold their financial responsibility in the payment of tuition and fees to Redeemer Christian School, as specified in the contract of enrollment. Families are responsible to apply for any and all scholarships of which they are eligible.